Odd weather is a constant in Ushuaia, Arg. It’s the weather that makes the difference whether we rock and roll or have smooth sailing. It’s the direction of the winds and how they hit the boat when we scoot into the open seas that determines the twist of the bronc. Right now, four hours into the sail, life jackets tried out, orange life boats with white circles for each fanny inspected, imposed, puttering along like riding a tractor, things seems copacetic. But the walls are starting to move and when you take a step it seems the floor might be coming up to meet your elbow - and No. I don’t drink. It’s been a long day - jelling with the 104 people sharing this excursion with me, not including 60 staff (they’ve got four big life boats that hold 55 each.) Most of the staff are Filipino (my spell checker won’t help me with that one) and don’t speak Spanish, which I cannot stop using. Most of the guest are over 50, maybe a few youngsters slipped in, and they seem to have seen the world and compare notes like someone would share the stock market over breakfast coffee. Most of the adventurers are counting on the wine and pisco sours to help them ignore the forecasted rolling of the ship. A soft roll, the director said. A roll is a roll, I thought. A few of us have nothing but a patch or a pill to run to in tough times. Obstinate as I am, I don't use a patch. The rooms are smaller than my car, and like my Ford Escape, I can get all my luggage in if I pile it up in a pyramid. Everything has to be battened down and the bathroom has fences at the ends of the shelves so toilet accessories won’t fall off. We’ll spend the next two days getting there, to wherever it is we are going first, and dealing with the effects of the seas. 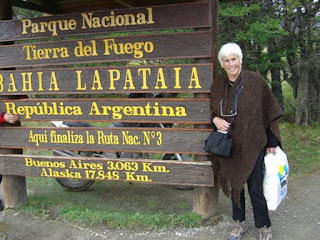 Before reaching our ship, the group was loaded onto three buses for an hour crawl down mud roads to what really is the end of the world - the end of the Pan-American Highway which runs from La Tierra del Fuego National Park up to Alaska. At both ends of this great highway (which is known for its robbers) the roads are muddy. But 18,000 kilometers or so could be quite a challenge by bicycle or car. Incidentally, Magellan came up with the name Tierra del Fuego because when he arrived here he saw fires all over the place which the Yamana Indians used for warmth (remember they basically lived naked). There are many fire legends - that the islands were erupting volcanoes or that dragons raged on the mountains. Also in the park are peat bogs covered in red moss but which are being destroyed by an uncontrolable expansion of beavers and rabbits originally brought here by settlers wanting to start a fur industry. Within 60 years, 20 beavers have grown to 100.000 and the beasts are destroying not only the forest but the environmental balance. Hunters are allowed to kill the beavers and rabbits, but they reproduce so rapidly and have no predator, so the important forest is becoming a wasteland of dead tree trunks. 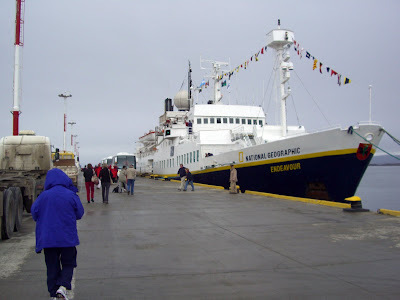 At the road's end, we boarded a catamaran to sail back to Ushuaia’s port where the National Geographic Endeavor waited for us to board, the buses having arrived with our bags, which were already in our rooms. En route, we closed in on an island covered in cormorants and fat, fuzzy seals that had no interest in our camera lenses. It’s 5 a.m. on Drake Passage, the roughest waters in the world. One wonders if one should have come here after riding the bronco all night. No, I don’t get sea sick. Yes. The waves are high. And it’s gray, rainy, and waves are pushing us around like a candy wrapper in the wind. I worry about losing my exercise routine although maintaining balance is no easy task. There is a small gym with a treadmill we can use "if weather permits." There is a stretch class this morn at 8. "If weather permits." Today, the day before Thanksgiving, we are listening to lectures and getting our sea legs - I might add sea heart. Although most of the guests are American, I don’t anticipate a turkey and trimmings meal tomorrow, when we expect to anchor down on Antarctica Peninsula, but just in case, I donated a jar of sage and of poultry seasoning to the chef last night and pray for stuffing.